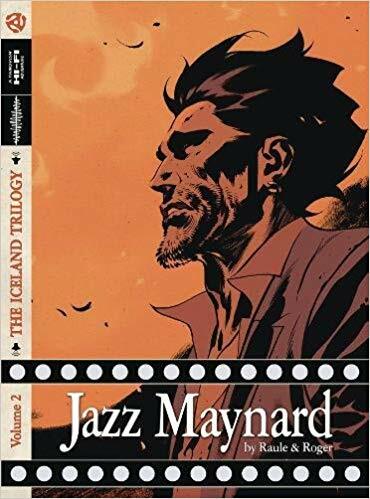 With excellent artwork and a fast-moving plot, Jazz Maynard Vol 2 continues the Iceland Trilogy. My review of the previous volume is here. Judas, Jazz’ former mob boss, is in jail. Caligula of a rival criminal organization is trying to take over his illegal operation by force. Jazz is approached by Lord Archer to steal back the Golden Eye, an ancient prosthetic eye supposedly having prophetic powers. To locate the eye, Jazz and Teo go to Iceland. Setting the story mainly in Iceland is a refreshing change from Spain. The action is non-stop. Plus I think having Vikings as the villains is fantastic. My favorite part of the whole series so far is the use of monochromatic colors for each panel. Some pages are different shades of green, others are purple or red. The most impact is when different character’s actions are shown on the same page using different color palettes. It is a very effective use of color to explain location. Ultimately, Jazz Maynard Vol 2 is a crime story. The plot and especially the artwork are very effective at telling the story. 4 stars! I can’t wait for the final volume to come out. Thanks to Lion Forge and Edelweiss+ for an advanced copy.